The Junior Championships start January the 4th in Portugal. Finn McGill (HAW) and Vahine Fierro (PYF) have taken out the 2017 WSL Men’s and Women’s Jeep World Junior Championship in Kiama NSW. The final day saw 28 heats run and history made with bumpy 3-to-4 foot waves on offer at Bombo Beach. Despite suffering an ankle injury and some incoming flight errors prior to the start of the Jeep World Junior Championship, Finn McGill managed to rise above to claim the coveted 2017 title. Surfing against a blisteringly inform Joh Azuchi (JPN), McGill showed little signs of slowing down, putting together an electric performance to post two excellent wave scores, an 8.00 and an 8.90 to bring his accumulative total to 16.90. McGill linked together a chain of giant backside turns in the final heat, which saw Azuchi requiring a combination of two-scores to take away McGill’s lead. McGill was not only being willed by the energy at Bombo Beach but also by a friend at home who was recovering in hospital. Former CT competitor and fellow Maui local Dusty Payne had a horror wipeout at Backdoor Pipeline yesterday and was at the forefront of McGill's thoughts as he went into Finals Day. Joh Azuchi is no stranger to success, bagging himself an ISA under 16 World title earlier in 2017. The young natural-footer was on a tear at Bombo beach, posting big scores and lighting up the small difficult surf in each and every Round and was a deserved finalist. Unfortunately for Azuchi he came up against a rampaging Finn McGill who put him in a combination situation straight off the bat. Azuchi will leave Bombo with his head held high as he became the first ever Japanese competitor in a WSL World Junior Championship Final. Vahine Fierro had a rocky road to the final that started in the middle of this season when she missed out on qualification by three spots. After an amazing showing in other regional Juniors, the young Tahitian was awarded a Wildcard into the WJC and didn’t let the opportunity go begging. Fierro built on her performances through each round and saved her best performance until the final where she met good friend Summer Macedo. Fierro took a commanding lead early with a 12.83 heat total awarded for a silky smooth approach in the trying conditions. Macedo failed to find a rhythm leaving Vahine to become the first ever WSL World Champion to come from Tahiti. Summer Macedo looked destined for a spot in the final taking down some of the event favourites with consistent searing performances. Like Azuchi in the men’s final, Macedo failed to get going in the last heat of the day coming short of the win but was stoked to have a final with her good friend Vahine. 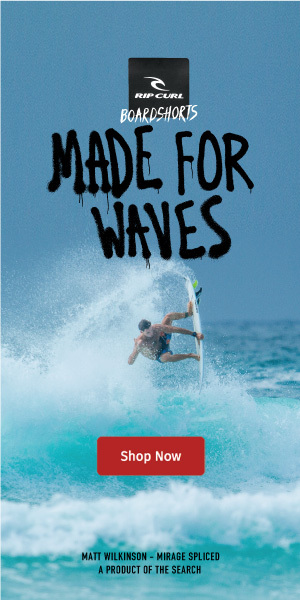 Anterior Billabong joins forces with Quiksilver Próxima IS KELLY SLATER WAVE CO AN IMPROVED COPY OF THE CLASSIC WAVE GARDEN?